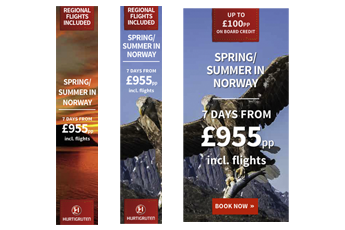 We were delighted to be approached by the Country Director of Hurtigruten UK to help out with digital adverts and direct mail design work. Having worked with this client on another brand we were able to hit the ground running and deliver another great project. We are looking forward to continuing the relationship and helping with the growth of this very unique brand moving forward. 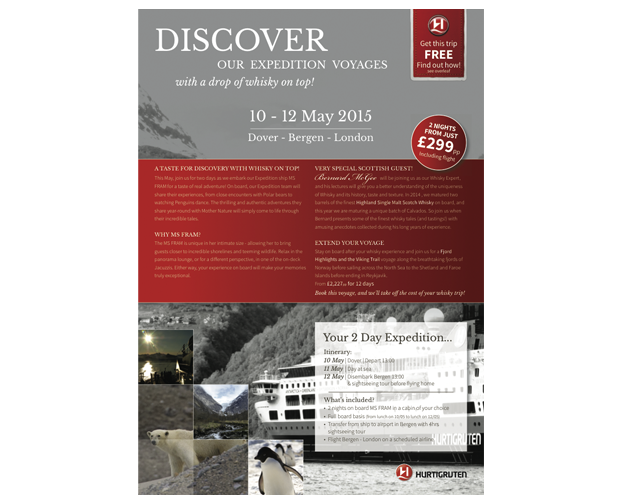 Hurtigruten UK is a daily passenger and freight shipping service along Norway’s western and northern coast between Bergen and Kirkenes. Sometimes referred to as Norwegian Coastal Express, Hurtigruten ships sail almost the entire length of the country, completing the round-trip journey in 11 days. The trip has been described as the “World’s Most Beautiful Sea Voyage”. Animated advertising banners for travel and newspaper websites. 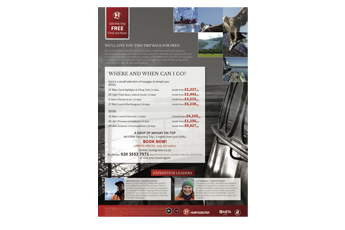 Press advertising and direct mail.